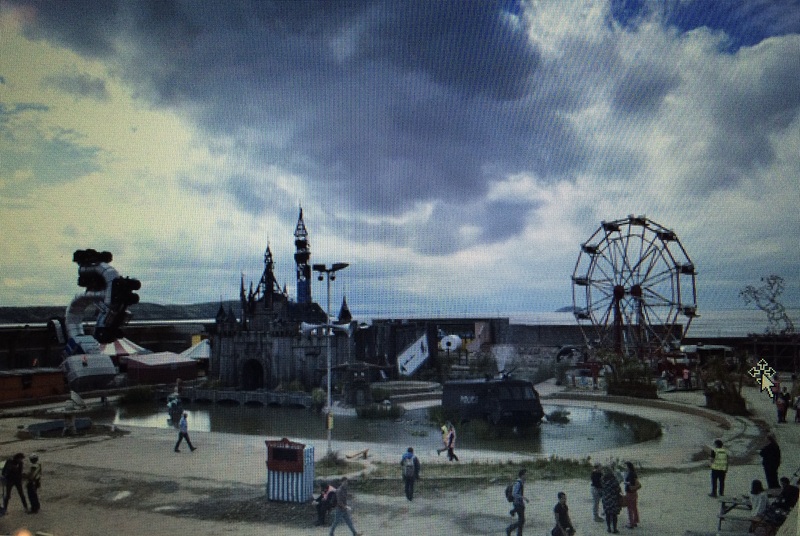 Dismaland draws the intrigued to its entrance. You enter through the winding roped off line; to guide yourself through a puzzle to the entrance. You cross the threshold of reality into art, cloaked in a theme of gray uncertainties. You glide along the cracked stone pavement. Inhaling dust as you kick it up into the air with your feet. The bare but busy landscape, is laid out with hints of nature but mostly metal. You draw near to a blue and white stripped booth. The starch material hanging so stiffly, if you touched it would feel like a wall. The words above the opening reads, Information, but no one inhabits the dark space. However, there are many cultures surrounding you all the same. While drifting through a contemporary composition of art exposing every detail to the beautiful confusion. Continuing towards the towering red Ferris wheel in the background. You pass by a couple eating at a table. The fragrance of coffee lingers under your nose as you leave them. You follow the wide arch in the pavement. You stop and gaze at the police van perched in the middle of the pond. The van is being contained by the water, like its own motionless chaos. Farther in the distance a sculptured horse, appears like it will gallop away into the clouds. The standstill Ferris wheel is almost humming like it is alive, wanting to move. Rust, moss, and dirt hovers under your nose as you lean you head back. Shadowing your eyes, looking upwards, you cannot see the farthest seat. Only a brief moment of hesitation that there even is one. You follow the trees that outline the pond. Coming to three large wide steps, in front of you stands the greying relics of the castle. The incomplete architecture shows the bones of the walls and the inner workings of the mechanics. This park is not incomplete; it leaves you with the chance to finish the details in your mind. Dismaland gives you mixed emotions as you complete your journey and return the way you came. Relaxed, calm, because of the effortless experience. Leaving you wanting more, like you missed something.